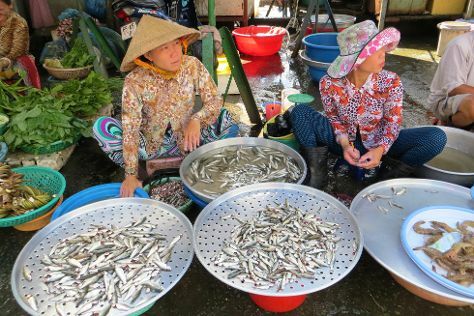 The main city of the Mekong Delta, Can Tho has a bustling atmosphere, with tourism and trade central to its liveliness. Change things up with these side-trips from Can Tho: Sa Dec (Huynh Thuy Le Ancient House & Sa Dec Market). There's lots more to do: make a trip to Ong Temple, kick back and relax at Can Tho Beach, look for gifts at Cantho Market, and indulge your taste buds at Sau Hoai's Rice Noodle Factory. To see photos, more things to do, and tourist information, read Can Tho trip builder website . Toronto, Canada to Can Tho is an approximately 28-hour flight. Due to the time zone difference, you'll lose 12 hours traveling from Toronto to Can Tho. Traveling from Toronto in March, expect Can Tho to be much warmer, temps between 38°C and 27°C. Finish your sightseeing early on the 17th (Sat) to allow enough time to travel to Hoi An. Venture out of the city with trips to My Son Sanctuary (in Duy Xuyen) and Da Nang (Lady Buddha, Da Nang Museum of Cham Sculpture, & more). And it doesn't end there: snap pictures at Japanese Covered Bridge, make a trip to Hoi An Ancient Town, stop by Rubin Cloth Shop, and head off the coast to Thuan Tinh Island. Plan my Hoi An trip by asking Inpirock to come up with tips and suggestions. Traveling by combination of flight and taxi from Can Tho to Hoi An takes 2 hours. Alternatively, you can do a combination of bus, flight, and taxi; or drive. Expect slightly colder weather when traveling from Can Tho in March: highs in Hoi An hover around 32°C, while lows dip to 26°C. Wrap up your sightseeing by early afternoon on the 24th (Sat) to allow enough time to travel back home.